The elliptical wing was decided upon quite early on. Aerodynamically it was the best for our purpose because the induced drag caused in producing lift, was lowest when this shape was used: the ellipse was ... theoretically a perfection ... To reduce drag we wanted the lowest possible thickness-to-chord, consistent with the necessary strength. But near the root the wing had to be thick enough to accommodate the retracted undercarriages and the guns ... Mitchell was an intensely practical man ... The ellipse was simply the shape that allowed us the thinnest possible wing with room inside to carry the necessary structure and the things we wanted to cram in. And it looked nice. That any operational aircraft off the production line, cannons sprouting from its wings and warts and all, could readily be controlled at this speed when the early jet aircraft such as Meteors, Vampires, P-80s, etc, could not, was certainly extraordinary. ^ Unit cost for airframe complete with engine, armament and equipment. ^ For many years, considerable debate occurred over the date of the first flight being the 5 or 6 March. Many of Supermarine's records from this era were destroyed during a bombing raid in 1940, and none of the surviving documents seemed to pin this down. This matter was almost conclusively answered in 1985 by aviation author Alfred Price, who received an account sheet with a handwritten note by Mitchell updating a line from "Not yet flown" to "Flew 5 Mar 36". See Spitfire: A Complete Fighting History, 1991, p. 165-166. ^ Although this is often perceived as Summers implying the Spitfire was flawless, this is not the case. What he meant was that he wanted nothing touched, especially the control settings, until he had consulted with Mitchell and the design team and suggested some improvements. ^ The Air Ministry submitted a list of possible names to Vickers-Armstrong for the new aircraft, then known as the Type 300. One of these was the improbable Shrew. 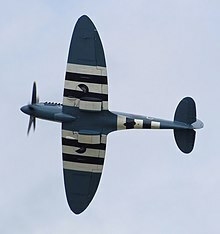 The name Spitfire was suggested by Sir Robert McLean, director of Vickers-Armstrongs at the time, who called his spirited elder daughter Annie Penrose "a little spitfire". The word dates from Elizabethan times and refers to a fiery, ferocious type of person; at the time it usually meant a girl or woman of that temperament. Previously, the name had been used unofficially for Mitchell's earlier F7/30 Type 224 design. Mitchell is reported to have said it was "just the sort of bloody silly name they would choose". ^ The pilot standing in front of the aircraft is pre-War Olympic hurdler, Sqn. Ldr. Donald O. Finlay, the commanding officer of 41 Squadron from September 1940 to August 1941, who adopted the aircraft as his personal mount. The same day P7666 was delivered to the Squadron, 23 November 1940, Finlay destroyed a Bf 109 on his first operational sortie in the aircraft. 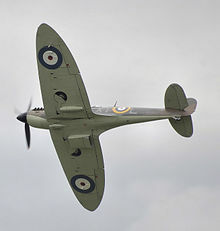 ^ A "Spitfire Lane" can be found on the road between Salisbury and Andover leading to the Chattis Hill aerodrome. ^ The test pilots were based at Highpost and flown by light aircraft to the other airfields. ^ Glancey notes that Rolls-Royce saw the potential of the He 70 as a flying test-bed for prototype engines, sending a team to Germany to buy one of the aircraft direct from Heinkel. The German government approved the deal, but only in return for a number of Rolls-Royce Kestrel engines. He also notes that Shenstone had worked with Ernst Heinkel in Germany. ^ Starting with the Merlin XII fitted in Spitfire Mk IIs in late 1940 this was changed to a 70% water-30% glycol mix. ^ On the ground, the flaps were normally lowered only for inspection or for maintenance. Pilots who forgot to raise the flaps after landing often found themselves paying a fine. ^ Early, Merlin-powered Spitfires were not the only aircraft to suffer from this problem, as other prewar aeroplanes also used carburettors containing a float chamber. In 1942, the United States acquired a flyable, Japanese Mitsubishi A6M Zero, known as the Akutan Zero. Test flying showed this aircraft also suffered engine cut-outs, due to the float-type carburettor of its Nakajima Sakae engine. The Americans devised tactics to counter the Zero in combat that took advantage of this and other results of testing the aircraft. .
^ This aircraft survived the war, only to be scrapped in 1945. The first pilot to fly K9789 was Squadron Leader Henry Cozens, whose career had begun in 1917 with the Sopwith Camel and ended after flying Meteor and Vampire jets. ^ The second cockpit of this aircraft has been lowered and is now below the front cockpit. This modification is known as the Grace Canopy Conversion, and was designed by Nick Grace, who rebuilt ML407. 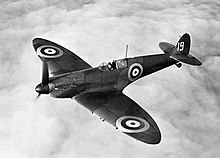 (For further details on surviving Spitfires see List of surviving Supermarine Spitfires). 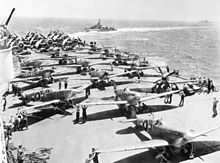 ^ Both of these airframes have a significant history in that they were acquired in the Second World War and used in the first war drives, which preceded the US entry into the conflict. 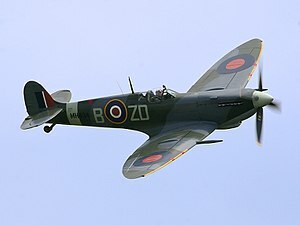 The Spitfire, donated by the British government in 1940, was the first example to come to the United States, and was used extensively as a propaganda tool, alongside the Stuka, recovered from the Middle East. ^ The Merlin 46 and Merlin 50 were also used in the VB. ^ a b c d Ethel 1997, p. 12. ^ "Ireland Air Force." Archived 1 December 2010 at the Wayback Machine aeroflight.co. Retrieved 27 September 2009. ^ a b Ethell 1997, p. 117. ^ a b c d e Price 1982, p. 67. ^ Ethell 1997, p. 6. ^ Andrews and Morgan 1987, p. 206. ^ a b Price 1977, p. 16. ^ Price 1982, p. 16. ^ Price 1982, p. 17. ^ Price 1977, p. 20. ^ Price 1999, pp. 16, 17. ^ Price 1977, p. 32. ^ a b c Glancey 2006, pp. 37–38. ^ Morgan and Shacklady 2000, p. 27. ^ Gunston et al. 1992, p. 334. ^ Quill 1983, p. 71. ^ Fleischman, John. "Best of Battle of Britain." Air & Space, March 2008. Retrieved 3 April 2008. ^ Price 2002, p. 38. ^ "Annie Penrose." Archived 13 January 2016 at the Wayback Machine Telegraph, 25 October 2011. Retrieved 7 November 2012. ^ a b McKinstry 2007, p. 55. ^ Deighton 1977, p. 99. ^ Glancey 2006, p. 43. ^ Glancey 2006, p. 44. ^ Ethell 1997, p. 11. ^ Price 1977, pp. 25, 27. ^ a b Price 1982, p. 61. ^ a b Morgan and Shacklady 2000, p. 45. ^ Price 1982, p. 65. ^ a b Glancey 2006, p. 61. ^ Ian Philpott (20 July 2006). The Royal Air Force - Volume 2: An Encyclopedia of the Inter-War Years 1930-1939. Pen and Sword. pp. 49–. ISBN 978-1-84415-391-6. Archived from the original on 8 December 2017. ^ a b McKinstry 2007, p. 145. ^ McKinstry 2007, pp. 152, 153. ^ Niall Corduroy (21 January 2017). Whirlwind: Westland's Enigmatic Fighter. Fonthill Media. pp. 35–. GGKEY:RNKZ64PU2TP. Archived from the original on 8 December 2017. ^ Price 1982, p. 107. ^ Price 1982, p. 109. ^ a b c Air International 1985, p. 187. ^ Delve 2007, p. 79. ^ a b c Price 1982, p. 115. ^ a b c Smallwood 1996, pp. 8–15. ^ "Revisiting town's Spitfire past". Wiltshire Times. 24 June 2009. Retrieved 8 April 2018. ^ Quill 1983, pp. 138–145. ^ Spitfire Testing Archived 26 November 2013 at the Wayback Machine. Retrieved 9 September 2008. ^ Price 1991, p. 68. ^ "Henshaw." Archived 12 March 2008 at the Wayback Machine angelfire.com. Retrieved 9 February 2008. ^ Price 1991, pp. 68–69, 71. ^ Price and Spick 1997, p. 70. ^ Price 1982, p. 249. ^ Danel and Cuny 1966, pp. 225–244. ^ Cross and Scarborough 1976, pp. 6–7. ^ a b Price 2002, p. 20. ^ Bodie 1991, p. 20. ^ Deere 2010, pp. 152–153, 170. ^ Morgan and Shacklady 2000, pp. 614–616. ^ Morgan and Shacklady 2000, p. 616. ^ Morgan and Shacklady 2000, p. 171. ^ Deere 2010, pp. 170–172. ^ Morgan and Shacklady 2000, pp. 57–61. ^ Price 1977, pp. 33–34. ^ Price 2002, pp. 17–18. ^ Lednicer, David. "The Incomplete Guide to Airfoil Usage." Archived 19 July 2011 at the Wayback Machine UIUC Applied Aerodynamics Group, 15 September 2010. Retrieved 26 June 2011. ^ a b Price 2002, p. 19. ^ Price 1977, p. 24. ^ Smallwood 1996, p. 16. ^ Price 2000, pp. 58, 61, 167. ^ Andrews and Morgan 1987, p. 216. ^ Morgan and Shacklady 2000, p. 4. ^ McKinstry 2007, pp. 79, 133. ^ Working with Irish Linen Archived 7 August 2010 at the Wayback Machine. Retrieved 27 July 2010. ^ McKinstry 2007, p. 260. ^ McKinstry 2007, p. 88. ^ McKinstry 2007, p. 110. ^ Price 1982, p. 147. ^ Price 1982, p. 144. ^ Deere 2010, p. 173. ^ Air Publications 1972, p. 5. ^ Tanner 1981, p. 23. ^ Dibbs and Holmes 1997, p. 190. ^ Tanner 1976, p. Section 1, Fig. 1. ^ a b Quill 1983, p. 272. ^ "NACA Report on lateral control research, p. 131." Archived 26 February 2009 at the Wayback Machine naca.central.cranfield.ac.uk.. Retrieved 27 June 2010. ^ Andrews and Morgan 1987, pp. 227–228. ^ Morgan and Shacklady 2000, pp. 464–475. ^ Price Wings of Fame 1999, p. 57. ^ Andrews and Morgan 1987, p. 264. ^ Andrews and Morgan 1987, pp. 264–267. ^ McKinstry 2007, p. 205. ^ a b McKinstry 2007, p. 206. ^ Williams and Gustin 2003, p. 93. ^ Williams and Gustin 2003, pp. 16, 93–94. ^ a b c Williams and Gustin 2003, pp. 93–94. ^ Keith, Claude Hilton (1946). I Hold My Aim. G. Allen and Unwin Limited. p. 78. ^ Williams and Gustin 2003, p. 95. ^ Buttler 2004, pp. 35, 50. ^ McKinstry 2007, pp. 181–184. ^ McKinstry 2007, pp. 118, 244–245. ^ McKinstry 2007, p. 222. ^ Price 1995, pp. 34, 37, 38, 55, 89, 92. ^ Price 1996, pp. 17, 35–37, 41, 62, 66, 91. ^ Stokes 1983, pp. 16, 191–194. ^ Price 1996, pp. 17, 44, 55, 64, 93. ^ Price 1996, pp. 11–13, 17, 42, 64, 67–68, 92. ^ Price 1995, pp. 56–57. ^ Price 1995, pp. 47, 82–83, 95–96. ^ Vader 1969, p. 153. ^ Glancey 2006, pp. 102–103. ^ Holland 2003, p. 232. ^ Zlobin, Igor (2006). "Spitfires over the Kuban". Lend-lease on airforce.ru. Archived from the original on 5 July 2017. Retrieved 30 October 2017. 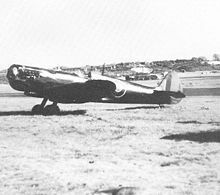 Along with British Hurricanes, the Soviet Air Force (voyenno-vozdushnyye sily - VVS) also managed to fly another aircraft of the Royal Air Force as a front-line fighter — the Spitfire Mk. Vb. In the West, this airplane is feted as the winner of the Battle of Britain, and is also a national symbol of World War II. In the skies of Russia, these fighters became participants in 1943 in the bloodiest battles over the Kuban. ^ Smith 2015, pp. 146–149. ^ Spick 1997, p. 165. ^ Young 2013, p. 36. ^ Young 2013, p. 5. ^ Nijboer 2009, p. 4. ^ Glancey 2006, pp. 122–123. ^ Morison 1958, p. 256. ^ Saunders, Hilary St. George (1954). Royal Air Force 1939–1945. III. London: HMSO. pp. 362–63. ^ "The 4th Fighter Group 1942-1945". The Official Site of the 4th Fighter Group - World War II. Association of the 4th Fighter Group - World War II. Archived from the original on 5 December 2017. Retrieved 4 December 2017. In between 29 September 1942 and 2 November 1945, the 4th — flying well over 400 combat missions in Spitfires, Thunderbolts and Mustangs — compiled an impressive record of accomplishments and topped all 8th Air Force fighter groups with 1016 enemy aircraft destroyed. ^ Gilman and Clive (1978), p. 314. ^ a b Aircraft performance and design (pdf file) pp. 5–6. Archived 10 September 2008 at the Wayback Machine. Retrieved 14 July 2008. ^ "Flight Archive: Air Force Cross." Archived 6 March 2012 at the Wayback Machine Flight, 22 June 1944. Retrieved 7 November 2012. ^ "UK Space Conference 2008: Test Pilot Discussion." Archived 24 July 2011 at the Wayback Machine space.co.uk. Retrieved 12 October 2009. ^ Quill 1983, p. 268. ^ Price 1991, p. 99. ^ Quill 1993, p. 135. ^ Flintham 1990, pp. 254–63. ^ Bowyer 1984, p. 84. ^ a b Bowyer 1980, p. 47. ^ a b Price 2002, p. 224. ^ a b Price 2002, p. 223. ^ a b "Grace Spitfire ML407." Archived 21 September 2013 at the Wayback Machine Grace Spitfire, UK. Retrieved 27 September 2009. ^ Brown 1978, p. 181. ^ Glancey 2006, p. 108. ^ Brown 1978, p. 185. ^ Price Wings of Fame 1999, p. 40. ^ Price Wings of Fame 1999, p. 36. ^ Andrews and Morgan 1987, pp. 255–56. ^ Price 2002, p. 191. ^ Vader 1969, pp. 135–41. ^ Thomas 2008, p. 77. ^ Thomas 2008, pp. 84, 85. ^ a b Whitehead, Christopher. "The Supermarine Spitfire, an operational history." Archived 4 September 2009 at the Wayback Machine DeltaWeb International, 1996. Retrieved 30 August 2009. ^ "Notable Planes." Archived 3 January 2010 at the Wayback Machine 81 squadron, 2009. Retrieved 30 August 2009. ^ Morgan and Shacklady 1993, p. 457. ^ Green 2007, p. 91. ^ McKinstry 2007, pp. 379–80. ^ Price 1991, p. 158. ^ "Supermarine Mark 1A Spitfire." Archived 13 June 2010 at the Wayback Machine Museum of Science and Industry (Chicago).. Retrieved 30 July 2011. ^ "List of Airworthy Spitfires." Archived 7 September 2009 at the Wayback Machine military-airshows.co.. Retrieved 23 February 2008. ^ Simpson, Andrew. "Supermarine Spitfire Mk.I K9942/8383M Museum Accession NO.72/A/263" (PDF). Royal Air Force Museum. Archived (PDF) from the original on 11 January 2014. Retrieved 19 June 2013. ^ "Spitfire." Archived 5 March 2012 at the Wayback Machine Fantasy of Flight.. Retrieved 6 March 2011. 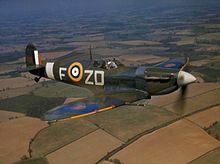 ^ "Restored World War Two Spitfire sold for £3.1m – BBC News". Bbc.co.uk. Archived from the original on 25 August 2015. Retrieved 23 August 2015. 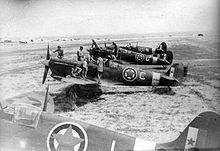 ^ "Search for 'buried Spitfires' in Burma called off" Archived 29 May 2013 at the Wayback Machine. BBC News, 16 February 2013. Retrieved 2 March 2013. ^ "Remember the guy who thought he found 140 lost Spitfires, buried underground? His story came to a really depressing end" Archived 20 January 2016 at the Wayback Machine. Business Insider UK, 15 September 2015. Retrieved 1 May 2016. ^ "Replica Aircraft". The Battle of Britain Memorial Trust. Archived from the original on 23 June 2013. Retrieved 16 January 2013. ^ "Roundabout is Real Highflyer". Birmingham Evening Mail. Archived from the original on 13 May 2013. Retrieved 16 January 2013. ^ "Displays." Archived 16 July 2011 at the Wayback Machine Thinktank Science Museum.. Retrieved 6 March 2011. ^ Glancey 2006, p. 206. ^ "Spitfire and Hurricane Memorial Museum." RAF Manston.. Retrieved 25 January 2014. ^ "Monument campaign for WWII female auxiliary pilots". BBC. Archived from the original on 11 June 2011. Retrieved 16 January 2013. ^ "Spitfire Emporium." Archived 16 February 2012 at the Wayback Machine spitcrazy.com.. Retrieved 11 December 2011. ^ "Eden Camp Modern History Theme Museum, Malton, North Yorkshire". Aviation Museum Guide UK. Archived from the original on 5 November 2013. Retrieved 5 November 2013. ^ "'Like every true Briton I wanted to fly a Spitfire': How one man built his own plane with a little help from B.C." nationalpost.com. 9 December 2016. Retrieved 8 December 2017. ^ "'If you can't buy one, Build One':". spitfiresocietytrustza.org. 28 April 2016. Retrieved 29 December 2018. ^ Eforgan 2010, Chapter 8. ^ "The Malta Story (1953) - Overview". tcm.com. Archived from the original on 6 June 2017. Retrieved 8 December 2017. ^ "Reach for the Sky (1956) Goofs". IMDb. IMDb.com. Retrieved 20 July 2017. The scenes set in the days leading up to the onset of the Second World War feature late model Mark XVI Spitfires with 'teardrop' canopies, four-bladed propellers and cannon in the wings. ^ "The Battle of Britain Spitfires". daveswarbirds.com. David Hanson. Archived from the original on 25 February 2017. Retrieved 20 July 2017. 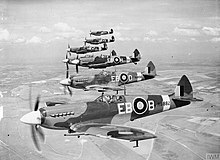 Spitfires were gathered from all around the world to become a part of the temporary air force used to film the movie. ^ Pearson, Richard (8 July 1990). "Anything But a Piece of Cake". The Washington Post. Archived from the original on 12 September 2017. Retrieved 9 September 2017. ^ Glancey 2006, p. 201. ^ "Guy Martin's Spitfire". Channel 4 Television. Archived from the original on 23 October 2014. Retrieved 23 October 2014. ^ Murugesu, Jason (3 August 2017). "How realistic are Dunkirk's Spitfire flight scenes?". newstatesman.com. Archived from the original on 8 December 2017. Retrieved 8 December 2017. ^ Morgan and Shacklady 1993, p. 172. ^ Jane 1946, pp. 139–141. Air Ministry. A.P 1565B Spitfire IIA and IIB Aeroplanes: Merlin XII Engine, Pilot's Notes. London: Air Data Publications, 1972. ISBN 0-85979-043-6. Andrews, C.F. and E.B. Morgan. Supermarine Aircraft since 1914. London: Putnam, 1987. ISBN 0-85177-800-3. Bodie, Warren M. The Lockheed P-38 Lightning: The Definitive Story of Lockheed's P-38 Fighter. Hayesville, North Carolina: Widewing Publications, 2001, first edition 1991. ISBN 0-9629359-5-6. Bowyer, Chaz. Supermarine Spitfire. London, Arms and Armour Press, 1980. ISBN 0-85368-464-2. Bowyer, Michael. Interceptor Fighters for the Royal Air Force 1935–45. Wellingborough, UK: Patrick Stevens, 1984. ISBN 0-85059-726-9. Brown, Eric. "Spitfires with Sea Legs, Part two." Air International, Vol. 15, No. 4, October 1978. Bungay, Stephen. The Most Dangerous Enemy – A History of the Battle Of Britain. London: Aurum, 2001. ISBN 1-85410-801-8. Buttler, Tony. British Secret Projects: Fighters and Bombers 1935–1950. Hersham, UK: Midland, 2004. ISBN 1-85780-179-2. Carpenter, Chris. Flightwise: Part 1, Principles of Aircraft Flight. Shrewsbury, UK: AirLife, 1996. ISBN 1-85310-719-0. Cross, Roy and Gerald Scarborough. Messerschmitt Bf 109, Versions B-E. London: Patrick Stevens, 1976. ISBN 0-85059-106-6. Cull, Brian with Fredrick Galea. Spitfires Over Malta: The Epic Air Battles of 1942. London: Grub Street, 2005. ISBN 1-904943-30-6. Danel, Raymond and Jean Cuny. Docavia n°4: le Dewoitine D.520 (in French). Paris, France: Editions Larivière, 1966. Deere, Brendon. Spitfire: Return to Flight. Palmerston North, NZ: ITL Aviation Limited, 2010. ISBN 978-0-473-16711-0. Dibbs, John and Tony Holmes. Spitfire: Flying Legend. Southampton, UK: Osprey Publishing, 1997. ISBN 1-84176-005-6. Eforgan, Estel. Leslie Howard: The Lost Actor. London: Mitchell Vallentine & Company, 2010. ISBN 978-0-85303-941-9. Ethell, Jeffrey L. World War II in the Air. Annapolis, Maryland: Naval Institute Press, 1994. ISBN 1-55750-249-8. Ethell, Jeffrey L. and Steve Pace. Spitfire. St. Paul, Minnesota: Motorbooks International, 1997. ISBN 0-7603-0300-2. Flack, Jeremy. Spitfire – The World's Most Famous Fighter. London: Chancellor Press, 1994. ISBN 1-85152-637-4. Green, Peter. "Spitfire Against a Lightning." Flypast, No. 315, October 2007. Green, William. Famous Fighters of the Second World War, 3rd ed. New York: Doubleday, 1975. ISBN 0-356-08334-9. Green, William. Messerschmitt Bf 109: The Augsburg Eagle; A Documentary History. London: Macdonald and Jane's Publishing Group Ltd., 1980. ISBN 0-7106-0005-4. Gueli, Marco. "Spitfire con Coccarde Italiane (Spitfire in Italian service)." (in Italian) Storia Militare n. 62, November 1998. Gunston, Bill et al. "Supermarine unveils its high-performance monoplane today (5 March)." The Chronicle of Aviation. Liberty, Missouri: JL International Publishing, 1992. ISBN 1-872031-30-7. Henshaw, Alex. Sigh for a Merlin: Testing the Spitfire: 2nd Revised edition . London: Crecy Publishing, 1999. ISBN 978-0-947554-83-5. Henshaw, Alex. "Spitfire: A Test Pilot's Defence." Aeroplane Monthly, Vol. 9, Issue No. 269, September 1995. Holland, James. Fortress Malta: An Island Under Siege, 1940–1943. New York: Miramax Books, 2003. ISBN 1-4013-5186-7. Jane, Fred T. "The Supermarine Spitfire." Jane's Fighting Aircraft of World War II. London: Studio, 1946. ISBN 1-85170-493-0. Jane, Fred T. Jane's Fighting Aircraft of World War II(reprint). New York: Crescent Books, 1998. ISBN 0-517-67964-7. Morgan, Eric B. and Edward Shacklady. Spitfire: The History (4th rev. edn.). London: Key Publishing, 1993. ISBN 0-946219-10-9. Morgan, Eric B. and Edward Shacklady. Spitfire: The History (5th rev. edn.). London: Key Publishing, 2000. ISBN 0-946219-48-6. Moss, Graham and Barry McKee. Spitfires and Polished Metal: Restoring the Classic Fighter. Marlborough, Wiltshire, UK: Airlife, 1999. ISBN 0-7603-0741-5. Price, Alfred. "The Birth of a Thoroughbred." Aeroplane, Volume 34, Number 3, No. 395, March 2006. Price, Alfred. Late Marque Spitfire Aces 1942–1945. Oxford, UK: Osprey Publishing, 1995. ISBN 1-85532-575-6. Price, Alfred. Spitfire a Complete Fighting History. Enderby, Leicester, UK: The Promotional Reprint Company Limited, 1991. ISBN 1-85648-015-1. Price, Alfred. The Spitfire Story. London: Jane's Publishing Company Ltd., 1982. ISBN 0-86720-624-1. Price, Alfred. Spitfire: Fighter Supreme. London: Arms and Armour Press, 1991. ISBN 1-85409-056-9. Price, Alfred. "Supermarine Spitfire (Merlin-engined variants)". Wings of Fame, Volume 9, 1997, pp. 30–93. London: Aerospace. ISBN 1-86184-001-2. Price, Alfred. "Supermarine Spitfire (Griffon-engined variants and Seafire)" Wings of Fame, Volume 16, 1999, pp. 30–85. London: Aerospace. ISBN 1-86184-037-3. Price, Alfred. The Spitfire Story: New edited edition. London: Weidenfeld Military, 1999. ISBN 1-85409-514-5. Price, Alfred. The Spitfire Story: Revised second edition. Enderby, Leicester, UK: Siverdale Books, 2002. ISBN 978-1-84425-819-2. Price, Alfred and Mike Spick. Handbook of Great Aircraft of WW II. Enderby, Leicester, UK: The Promotional Reprint Company Limited, 1997. ISBN 0-7858-0669-5. Quill, Jeffrey. Birth of a Legend: The Spitfire. London: Quiller Press, 1986. ISBN 0-907621-64-3. Rearden, Jim. Koga's Zero: The Fighter That Changed World War II. ISBN 0-929521-56-0, second edition, Missoula, Montana: Pictorial Histories Publishing Company, 1995. Originally published as Cracking the Zero Mystery: How the US Learned to Beat Japan's Vaunted WWII Fighter Plane. ISBN 978-0-8117-2235-3. * Shores, Christopher and Brian Cull with Nicola Malizia. Malta: The Spitfire Year. London: Grub Street, 1991. ISBN 0-948817-16-X. "Spitfire: Simply Superb, Part three." Air International, Volume 28, Number 4, April 1985. Stokes, Doug. Paddy Finucane, Fighter Ace: A Biography of Wing Commander Brendan E. Finucane, D.S.O., D.F.C. and Two Bars. London: William Kimber & Co. Ltd., 1983. ISBN 0-7183-0279-6. Vader, John. Spitfire (Ballantine's Illustrated History of World War II). London: Ballantine's Books, 1969. Williams, Anthony G. and Dr. Emmanuel Gustin. Flying Guns: World War II. Shrewsbury, UK: Airlife Publishing, 2003. ISBN 1-84037-227-3. 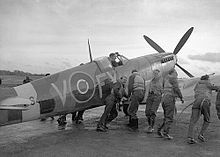 Wikimedia Commons has media related to Supermarine Spitfire. 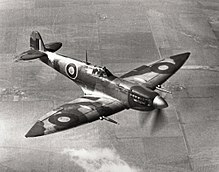 A photograph of the 1939 "Speed Spitfire" in Flight. This page was last edited on 12 April 2019, at 04:33 (UTC).